Exhibition of artwork by the artists of Shed 13 Cricket Green School in London, England. 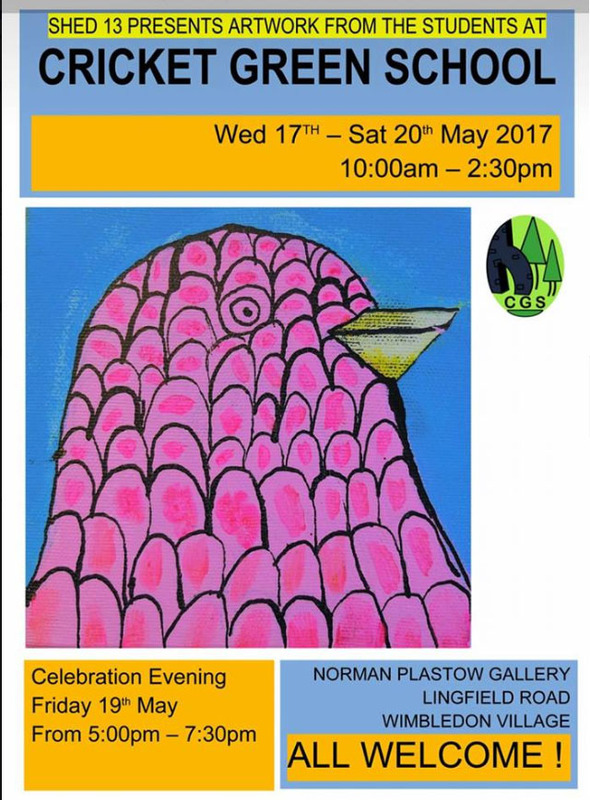 Wed 17th – Sat 20th May 2017. Lots of the work is on sale to raise funds for Shed 13 art studio. Please go along and support the young artists if you can! We are sad to report that our art collection and archive, both of which date back to the beginnings of Room 13 in 1994, have been badly damaged by a flood of sewage in our premises at The Window, gallery and project space in Caol Shopping Centre. The flood, which happened early in the New Year, was the result of a blockage in the drain further down the street. Under a build-up of pressure, sewage was forced out through the toilet in Room 13’s premises at the end of the block, covering much of the ground floor. We would like to thank the local representatives of Scottish Water, who attended very quickly to remove the blockage. They also assisted and gave advice in dealing with the aftermath; as a result of their help it has been possible to contain the problem and assess the damage. The art collection – canvases, works on paper and framed works, plus archive material, papers and photographs documenting Room 13 since its beginnings in 1994, were being temporarily stored in the Window following the emptying and demolition of Caol and Lochyside RC Primary Schools. The majority of works in the collection were created by young artists in Caol and Lochyside Primary School Room 13 studios between 1994-2016. Among the works were several large scale canvases that had previously been exhibited in major galleries in Scotland, and across Europe. The Room 13 team and Board are horrified by what has happened and deeply upset at the loss of an invaluable and irreplaceable asset. A full statement about the status of the Room 13 collection will be issued once the assessment of damage is complete. 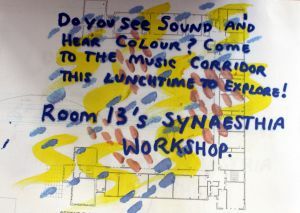 Do you see sound and hear colour? Lochaber High School students Maddie Lennon, William Landsborough and Jennifer McKenna worked with Room 13 Artist in Residence Audrey O Brien to present Synaesthesia, an interactive art workshop using new digital media to explore Synaesthesia, a condition that can make you see sounds as colours. Taking over a corridor on the second floor of Lochaber High School, the artists splashed colour into the minds of a lunchtime audience. The school is newly refurbished and it is forbidden to hang anything onto the walls. Artist Audrey has been encouraging the group to take ownership of the white spaces and propose changes through visual art ideas and events. 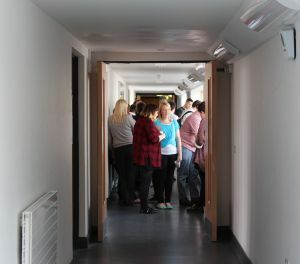 This temporal event was the outcome of the Ideas group which developed through a series of quick lunchtime conversations, building tours and ideas sharing. The idea came from one of the artist’s experience of synaesthesia. The artists used technology new to the school – a creative electronic tool with touch sensors to present this invention to their audience. Four musical tracks were selected from Maddie’s personal collection and uploaded to a touch board. People touched the interactive surface to set off an audio sensor. MP3 files were played and the audience was to select a colour to represent what they “saw” when listing to the four musical tracks. Interesting project – I could “see” shape easier for violin but colour for the others. Very interesting, I loved the idea of this. I seemed to relate a colour to trumpets and violins which coincided with someone else’s’ choice → weird! I was most confident of the drums – pink and red and pulsing. The violin was pretty intensely purple too. Very cool, thought provoking project! Very interesting and fun. Have been using colour as a relaxation tool, related to memory and the colour → related to a shape and sound. Interesting, weird, but very easy to see colours – so cool! This is a great idea! it really made me think about the sounds. Love the idea of this and its a great way to try and understand how some people see, hear, touch and smell the world. Its really strange but it shows how certain colours mean different things to people. Audrey O Brien was appointed by Room 13 International in 2015/16 to work with pupils and staff to develop and deliver a series of cross curricular projects and creative engagements at Lochaber High School. Audrey’s role, and the many projects she effected during her residency with Room 13, was made possible with project funding from Highland Youth Arts Hub and supported by Creative Scotland’s Time to Shine initiative.